Deoli is located in South Delhi district. An assembly constituency reserved for the Scheduled Castes (SC), Deoli belongs to South Delhi parliamentary constituency. It came into existence after the implementation of the recommendations of the Delimitation Commission of India. 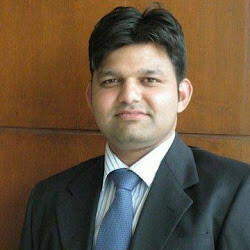 Prakash Jarwal of AAP is the present MLA from the constituency. He defeated Gagan Rana of BJP in the 2013 assembly polls. 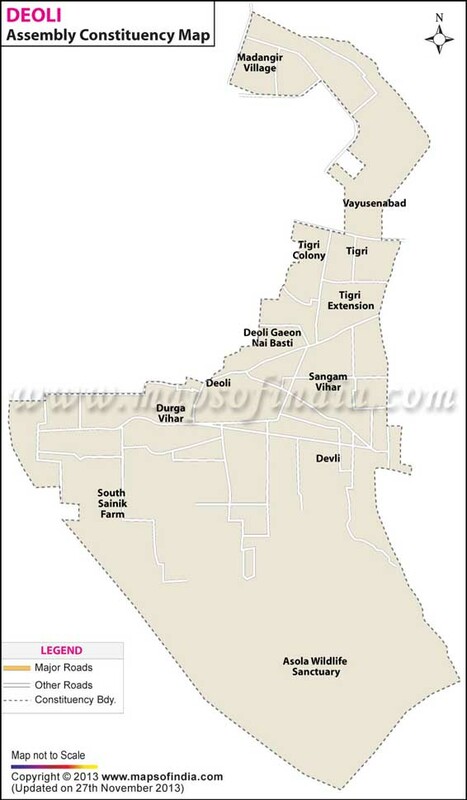 Map showing the different localities of the Deoli Assembly Constituency. Below is the list of winners and runners-up in the Deoli assembly elections conducted so far. Dakshinpuri Extension 1 - Blk No 13, Dakshin Puri Ext1 - Block 13 Kabir Mandir, Dakshin Puri Extn Dr Ambd Ngr, 2 - Block 13 Dakshinpuri Ext, Dr Ambedkar Nagar1 - Block-7, Dakshin Puri Extn Dr.Ambedkar Nagar1 - Block -6, Dakshin Puri Extn Dr. Ambedkar Nagar1 - Block -6, Dakshin Puri Extn Dr. Ambedkar Nagar1 - Block-6, Dakshin Puri Extn Dr. Ambedkar Nagar, 2 - Shop No 1 To 72 Block-6&7, Dakshin Puri Extn Dr. Ambedkar Nagar1 - Block-5, Dakshin Puri Extn Dr.Ambedkar Nagar1 - Block-5, Dakshinpuri Ext Dr Ambedkar Nagar1 - Block-5, Dakshin Puri Extn Dr.Ambedkar Nagar1 - Block-5, Dakshin Puri Extn Dr.Ambedkar Nagar1 - Block No.8, Dakshin Puri Extn Dr.Ambedkar Nagar, 2 - M.C.D.Office Block-8, Dakshin Puri Extn Dr.Ambedkar Nagar, 3 - Block -8, 13 Market, Dakshin Puri Extn Dr Ambedkar Nagar1 - Block-12, Dakshin Puri Ext Dr.Ambedkar Nagar1 - Block-11, Dakshin Puri Extn Dr.Ambedkar Nagar, 2 - Block-11, Dakshin Puri ExtnDr Ambedkar Nagar, 3 - Block 11, Market Dakshin Puri Extn Dr Ambd Ngar1 - Block-10, Dakshin Puri Dr.Ambedkar Nagar, 2 - Opp Block 10, Raja Ram Market Dakshin Puri, 3 - Block-10, Dakshin Puri Dr.Ambedkar Nagar1 - Block-10, Dakshin Puri Dr.Ambedkar Nagar1 - Block-9, Dakshin Puri Extn Dr.Ambedkar Nagar1 - Block-9, Dakshin Puri Ext Dr Ambedkar Nagar1 - Block-3, Dakshin Puri Ext Dr.Ambedkar Nagar1 - Block-3, Dakshin Puri Extn Dr.Ambedkar Nagar1 - Block -4, Dakshin Puri Extn (Dr.Ambedkar Nagar)1 - Block-19, Dakshin Puri Extn Dr.Ambedkar Nagar1 - Block-19, Dakshinpuri Ext Dr Ambedkar Nagar, 2 - New Subhash Camp, Dakshinpuri Ext Dr Ambedkar Nagar1 - Block 1, Dakshin Puri Extn.1 - Block 2, Dakshin Puri Extn., 2 - Block 2, Dakshin Puri Ext1 - Block 2, Dakshin Puri Extn., 2 - Shiv Mandir, Dakshin Puri Ext1 - Block 14, Dakshin Puri Extn.1 - Block 14, Dakshin Puri Extn., 2 - Block 14, Dakshin Puri Extn., 3 - DDA Market, Block - 14, Dakshin Puri Extn1 - Block 16, Dakshin Puri Extn., 2 - Blind House, Blk 16 Dakshin Puri Extn, 3 - Shiv B N K Kender, Blk 16 Dakshin Puri Extn1 - Block 16, Dakshin Puri Extn.1 - Block 17, Dakshin Puri Extn., 2 - Block-17, Dakshin Puri Extn., 3 - Block -17, Dakshin Puri Extn1 - Blk 20, DDA Flats Dakshinpuri Extn.1 - Block - 20, DDA Flats Dakshinpuri Extn., 2 - Block-18 DDA Mkt, Dakshinpuri1 - Block 15, Dakshin Puri Extn.1 - Block 15, Dakshin Puri Extn. Shaheed Camp 1 - Saheed Camp Jhuggi, Dakshin Puri Extn.